The Initialize Volumes in an AML (RBSINZAML) command in Robot Save allows you to initialize volumes in an AML. You can use the command to initialize scratch pool volumes that are reserved to a system. For example, volumes that have been moved to the scratch pool from the Error Resolution panel or have been removed from a rotation and contain unexpired data remain assigned to the system on which the correction was made. Because you cannot remove the reservation, this prevents the volumes from being used by other systems in the data center. Using the RBSINZAML command allows the volumes to be used by any other system connected to the AML. You can use the RBSINZAML command with both IBM and StorageTek AMLs. To queue volumes for initialization, display the Scratch Tape Pool Maintenance panel on the reserved system. Enter option 11, Mark Volume for Initialization, next to each volume you want to initialize. This removes the volume from the assigned system and changes its status to *INZTAP, ready to be initialized. The volumes to be initialized must be in an AML location. You also can initialize unreserved volumes in the scratch pool. Although these volumes are not reserved, you must select them for initialization from the DCMS. Volumes marked for initialization (*INZTAP) cannot be used in a backup until they’ve been initialized. 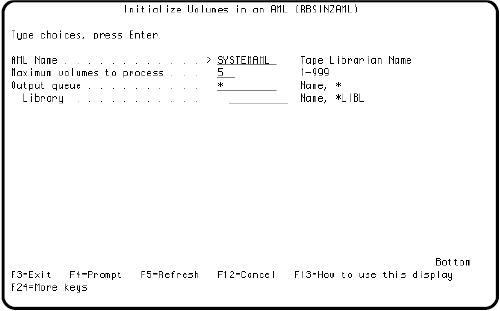 After you have selected the volumes to be initialized, enter the RBSINZAML command to begin the initialization process. You can issue the RBSINZAML command from any system attached to the AML.